When adapting successful stage play for the cinema, the writer and the director always have to face the question of how much to 'open up' the material without compromising the original. In adapting the hit comedy-drama Educating Rita for the big screen, director Lewis Gilbert and writer Willy Russell had a bigger hurdle than usual to jump here, for not only was the play set in just one room, it was also a two-hander! On stage, the story involved the attempts of a college professor, Dr Frank Bryant, to introduce the finer points of literature to a mature Open University student by the name of Rita, a Liverpudlian hairdresser determined on improving her lot in life. However, the journey into Academia isn't an easy one for Rita, for though enthusiastic, she finds the course harder than she expected. She also has to withstand her husband Denny's disapproval (he wants her to stay at home and bring up kids). As a piece of theatre, this all worked marvellously. On screen, though, it had the potential of being static and dull, hence Lewis Gilbert's initial reservations about tackling the project. "My wife first saw the play and then took me to see it, and I must admit, it didn't sound like it would make a good film, being a two-hander," comments the director. "In the play, Rita just came in and told her story to the teacher during her tutorials. But I immediately saw that the stories she was telling could be the basis of the film. The parts she acted out for the teacher - her husband, her friends - could be introduced as actual characters." 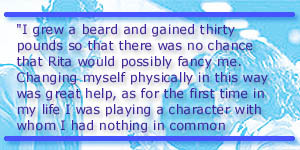 Indeed, although Willy Russell had always intended the original play as a two-hander, it was also his aim "to make the audience feel as if they'd engaged with many other characters throughout the evening." Getting the play version of Educating Rita off the ground had proved a harder task than the author had imagined. "I remember walking along Shaftesbury Avenue with my then-producer Bob Swash when I was writing the play," recalls Russell. "Bob knew I was toying with the idea of doing a two-hander - and he pointed to what is now known as The Gielgud Theatre where a two-hander starring Ralph Richardson and Jessica Tandy had closed after just four weeks. He said, 'See! Two-handers, they're a disaster at the box-office!' Well, that spurred me on even more. I know that if I could get it right, I could overcome that problem." Finally completed, Educating Rita made its début at the RSC's Warehouse Theatre in late 1979, with Julie Walters in the Rita role. Soon after, the play successfully transferred to the Piccadilly Theatre in London's West End, where both the play and Walters delighted audiences and critics alike. Given its rave notices and full houses, it wasn't long before film companies began taking an interest. "I got a call from my agent to say that Columbia were interested in acquiring the rights to Rita," recalls Russell. "I remember thinking, 'Are they mad?' I imagined they wanted to make an art film like Who's Afraid of Virginia Woolf? And just put the camera in front of the stage sets! Well, there was a meeting set up, and my attitude was that perhaps I should just take the money and run! "Anyway, before the Columbia meeting arose, there was a call from Lewis Gilbert. I happened to be in the office at the time, and my agent, Peggy, said, 'Dear, that was Lewis Gilbert. He's now interested in Educating Rita too, but of course you can't talk to him because Columbia have got in first. But he still wants to meet you darling.' I thought meeting with Lewis was pretty pointless, but Peggy said that courtesy demanded it. Well, I was heading back to Euston to get the train back to Liverpool when it dropped into my head that Lewis had made Alfie, which was a film that I'd really admired. I loved the fact that he'd brought off that direct address to the audience in a cinematic way. The device can be really effective in the theatre, but it's not often that it works in a film. In Alfie, though, it just bowled along. So I told the cabbie to hold on while I fished out Lewis's address, and then went over to see him. "When I got there I said to Lewis, 'Look, I've come to see you, but I don't know whether we should be taking as Columbia are interested in the script, and I haven't really thought of Rita as a movie.' Lewis just said to me. 'I think the whole of the plot is in there. Every single character already exists in the play, even though they're not realised on stage.' So in the discussion I got out of the idea of the unity of the single room and started to think of the unity of a campus. I started to get excited, as I could see all the possibilities that I'd been too lazy or too resistant to see!" However, Russell's enthusiasm was quickly dampened. "I came back to earth because I then remembered that Columbia had expressed this interest," says the playwright. "But Lewis said, 'That's fine. I'll make it with Columbia. Let's phone them now!' So he phoned Columbia, they talked and things seemed to be acceptable. 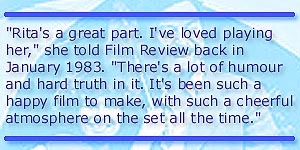 So initially, we began with the play being acquired by Columbia, with Lewis directing it for them." Lewis Gilbert had already directed a number of successful films for Columbia dating back to the late-Fifties, among them The Admirable Crichton and HMS Defiant. The fact that his last two films had been two of the most successful James Bond films ever - The Spy Who Loved Me and Moonraker - can't have been lost on the executives at head office either. That said, Gilbert, who also produced Rita, ultimately made the film independently through an outfit called Acorn Pictures. In the meantime there was the not-so-small task of preparing the script for the screen. "We used to meet each other a lot and discuss how we'd open the film out and that sort of thing," says Lewis Gilbert. "So we worked quite closely on that, as we also would on Shirley Valentine." Even so, Russell still had his reservations as to whether the play could be successfully opened out. "Now I'm not somebody who's precious about the play. I wanted it to be as truthful to the medium of film as I'd been to the medium of theatre. I didn't want some art-house thing. So you constantly have to ask yourself why you want to make a film of the play. For my own purposes, once I'd realised that the campus was the centre of the film, I was away and there was no problem for me." Educating Rita was Willy Russell's first screenplay and consequently he had to get used to a very different way of working. "Initially what happened was I spent five days with Lewis in Paris," says Russell. "It was very odd for me, as I'm not used to having a director dictate to me! All the films I'd written previously had been for the telly, where, like the theatre, the writer was absolutely the top nut and everything was dedicated to serving the text. So for those five days Lewis would say, 'We want to have this from the play and we want to have that from the play, but we don't want to have this because it won't work.' I just took notes, and after about three days I thought, 'I can't write a film like this. There's absolutely no way!' but Lewis was a sweetheart and the dinners were nice," Russell laughs. "So I just kept my mouth shut and made the notes, knowing that when I got home I'd just sit down and start writing the film," he continues, "In fact, I did just that. I'd got the first 26 pages done when Lewis phoned to ask how things were going on. I said, 'Terrific! I'm really pleased.' Then he asked, 'Are you following the schemata/' to which I replied, 'No, no - the Paris thing, I'm sorry, I've chucked it in the bin!' Well, he went ape-sh*t! But again, it was the thing of me not bending. You need all the arrogance you can muster if you're going to survive in films, especially if you're going to be involved in translating a work that has been so successful on stage. So I said that there was no way I was going to follow those notes. At the end of the conversation Lewis was somewhat shattered and said, 'Look, send me what you've done so far.' I told him I couldn't because it was in longhand and he wouldn't be able to read a syllable. So I said I'd get on a train the next day and go down to London and read it to him. And God love him, at the end of it he said, 'Carry on!" As the script was progressing, Gilbert began to turn his mind to casting. The director hadn't worked with Michael Caine since Alfie back in 1966 ("We'd been looking for something to do together ever since," says Gilbert). 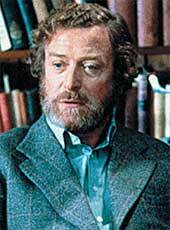 So was Caine actually the first choice to play the alcoholic Dr Frank Bryant? "He was, yes, Michael was longing to do it. The real trouble I had was getting Julie. The Americans, who I was doing the film with, wanted somebody American for Rita, and they suggested Dolly Parton of all people! I wouldn't have that. I told them we had to have the girl who'd played the part on stage in England, but they wanted to move the setting of the play to America. Then they came up with the idea of having an American professor working in England, but again, for this film, that would not have rung true. Michael was perfectly cast, and he thinks it's one of the best performances he's ever given in a film, I think so too." Meanwhile, Gilbert offered Julie Walters the part of Rita. As the actress recalled at the time to the London Evening Standard, "I knew what was going on and Lewis kept me in touch with all the developments. The day he rang me and said I had got the part was my birthday. It was a smashing present." Her telling performance turned Walters, already familiar to British TV audiences through her work with Victoria Wood, into a star. "I feel I understand her really well," Walters continued about her role. "I come from a working class background, went to college and I remember starting to move round in middle class circles and the feeling of smallness it gave you." Still, she enjoyed being treated like a star on set. "The way people cosset you is lovely. There are cars to take you everywhere and everyone makes such a fuss. But the first day I went to rushes and saw my face on that big screen I nearly fainted." Yet Walters recognised that this was her big break and that Rita was a gift for any actress. "Rita's a great part. I've loved playing her," she told Film Review back in January 1983. "There's a lot of humour and hard truth in it. It's been such a happy film to make, with such a cheerful atmosphere on the set all the time." In the stage play, it's mostly Rita who does the talking, recalling her life and telling Dr Bryant of her ambitions. Michael Caine had no qualms about playing second fiddle, though, as he explains in his autobiography What's It All About?" "In the play, Rita does all the moving about on stage, while the man, for the most part, just sits at his desk and listens and reacts. Now the theatre is about 'acting'; the cinema is about 'reacting'. When Rita said something, the camera had to cut to me for my reaction. You can't do that on stage, and that's what happened to balance the weight of the two parts in the film." So, given the length of time it had been since Lewis Gilbert and Michael Caine had worked together on Alfie, did the two have the same chemistry on set? "Strangely enough, it was like we hadn't been away," enthuses Gilbert. "It was very odd because it had been 15 years or so since we had worked together. We were very much on the same wavelength, because we'd both come from a working class background. It was great working with him. And what was nice - even though we've only done two films together - is that each time he earned an Academy Award nomination and won the BAFTA in London." Says Michael Caine in his book, "A couple of weeks into shooting, Lewis sidled up to me one morning just as he had on Alfie, and whispered, "I think you'll get an Academy Award nomination for this, Julie as well." As usual, he was right on both counts." Indeed, Caine and Walters did both get nominated, a prediction Caine himself had also made about Walters' performance in Film Review at the time. "I won my first Oscar nomination for Alfie and I've got a feeling that Rita could do the same for Julie." Despite its Liverpool setting, Educating Rita was made in the Republic of Ireland, with Dublin's Trinity College acting as the campus, much to the consternation of Willy Russell. "What freaked me initially was that apparently the supporting players, who should have been cast out of Liverpool with authentic Liverpool accents, were cast out of Dublin," he says. "Now Lewis doesn't care that people in Liverpool are going to be horrified, because he's making a film for the world. But for me it was really precious. One of the things that people fail to understand is that a dramatist does not write words for their meaning, he's actually working in sounds, like a composer. So if you write something for the cello and it's played on the horn, no matter how great the horn playing is, it's still not a f***ing cello! I was just withered. 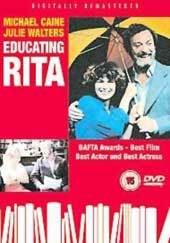 I just had to accept that this was Lewis Gilbert's film of Educating Rita." Russell was happier that Michael Caine would be playing Frank Bryant, however. "That was sensational. I'd been a great fan of Alfie, and having seen Michael be never anything less than wonderful, even in films that were not so wonderful around him, well I was just absolutely thrilled." Meanwhile, Michael Caine was equally delighted with Julie Walters' performance, despite some initial reservations. "Lewis and I were a little concerned at first, this being her first film and her with a theatrical background," the actor admitted in his autobiography. "Both of us had worked on films before with basically theatre actors, and it's always hard to pull their performance down from acting, which is the theatre, to behaviour, which is film acting … In films you have real people and they don't act, they simply behave and react. Our concern turned out to be groundless, because Julie understood all this instinctively and mastered it so quickly." As Willy Russell reveals, Caine was also happy with the script. "I went out to Dublin for a week, just to be on hand, but there was very little tweaking needed," says the writer. "I remember Michael Caine saying to me, 'You know, I've barely had to change a line of this!' In film terms it was an enormous compliment, whereas in the theatre it would have been staggering! Apparently, Michael would often happily re-work a page of dialogue without any say-so to the original author if he felt like it." Indeed, as a joke, Caine managed to slip in a line he's often credited with, but until that point had never actually said in a film, "Not a lot of people know that." When the film finally opened, not only was it a huge commercial success, it also garnered some excellent reviews. For Walters herself, though, it was the praise of her mother that really mattered. "She always speaks her mind, so when she said I was okay I know I had really passed the acid test," he laughed. Naturally, Lewis Gilbert was thrilled with the film's success, particularly the Oscar nominations for Walters, Caine and Russell, even though he was overlooked himself. "That often happens, but it doesn't worry me," he says of the snub. "It was quite an honour to get the nominations we did. When you think of the number of films that are shown in America, for your actors to get a nomination is marvellous, really. The commercial success, that's also another reward. It means that a lot of people have gone along to see your film and have enjoyed your work. That's something really worthwhile." Russell was also thrilled to be nominated for his first screenplay. "Of course I was pleased," he enthuses. "Indeed, I spent all of that year after the film was released trucking from one award ceremony to another. It was weird though, because I'd just opened Blood Brothers in the West End. Every film ceremony I went to I came away from empty-handed, yet every theatrical ceremony I went to I came away with the best musical award!" But, as Russell says, "the Oscars were certainly an experience, though not one I'd rush to repeat." Russell nevertheless looks back with great affection on the two films he made with Lewis Gilbert. "I'm very happy with those films," he says. "I could still argue about moments in them, but I still think they're fairly faithful cinematic reflections of the experience you'd have in the theatre."